Do you feel the impression of how the creature that earthworm? Bad feeling, No touch, In the soil…should have different impression. By the way , do you know “Kantaro”? It is a species of earthworm , and the annelid worms of the family Futomimizu, which is a large type.In general has been known by the name of Von Siebold earthworm, is said that the origin of the name. Kantaro bear the scientific name to Pheretima sieboldi (Horst. 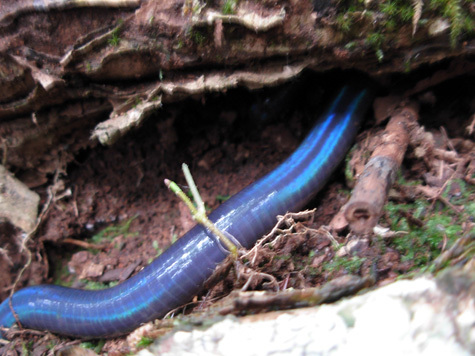 ), a large earthworm belonging to the genus of the family Futomimizu,Futomimizu rope, Annelida Oligochaeta. Although the length of the individual will be 25 ~ 28cm, to about 14 ~ 15mm thick and mature, with large populations more than 30g body weight, reach more than 40cm in length exists. For the whole body is indigo blue, and determine the species is easy. Light hits the light and sleek, it is very beautiful earthworm. Siebold earthworms are distributed around Shikoku, Kyushu, Chugoku and down into the Ryukyu Islands. But south of Yakushima they are not distributed. Closely related species are widely distributed around the world, particularly in Southeast Asia. In Japan, over 60 species of the genus Futomimizu are distributed. They are living up to several cm from the surface of the soil under deciduous forest mainly, and seems to winter deep into the warm ground in the winter. That inhabit the forests of various types, such as cedar and cypress plantation and broadleaf forest. During the rainy season is often witness to appear on the surface. Earthworm excrete feces on the absorption of particulate organic matter and microbial digestion, the small animals in the soil. By it, and has been the formation of soil suitable for plant growth.Therefore, it is treated as a beneficial insect in agriculture in general, be used for soil improvement. They are about the same amount of food ingested from half of body weight per day, that feces can be used as a high-quality fertilizer and soil conditioner. There is a method given as feed for earthworms to organic matter such as garbage actively from this, that excrement be used as a fertilizer called “worm composting”. They can be found anywhere after a heavy rain, especially on the mountain behind the shrine in Asakura. I watch it when I went to climb mountain. It is very big, I surprised . I’m surprised Kantaro is big. Kantaro is very strange and beautiful. I like Kantaro for first impression.I moved that size and color. I was surprised that they are useful for agriculture. I think that kantaro may become the good food for the mole. I think kantaro is very sutrang!! Although that it is naturally felt, it was interesting when got to know anew. looks tasty… that’s what I thought when I first saw it, then I collected a hand full of it and wash it in the water, take it out and add a ketchup sauce ….. yummmm… yummy… seriously….